Sounds “Star-Trecky?” Space-time is any mathematical model combining space and time into a single interwoven continuum. In other words, space and time both exist and play off one another. Spacetime has space consisting of three dimensions, and time as consisting of one dimension-the “fourth” dimension. Roddenberry was the first science-fiction writer to transform “spacetime” on the television screen in the 60s. 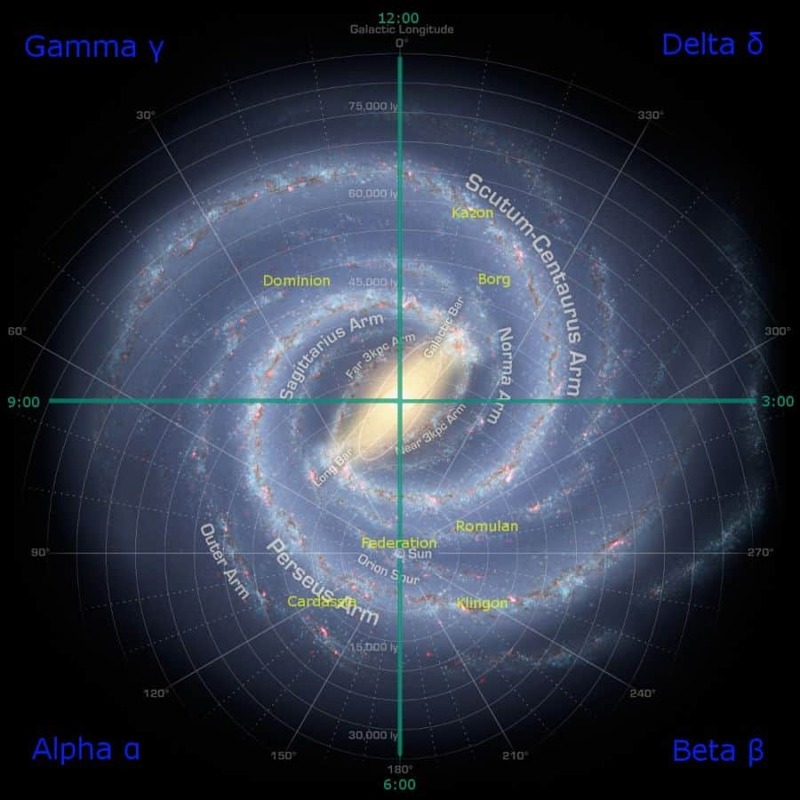 This is a image of the Milky Way Galaxy from NASA that has been overlaid by with the Star Trek method of viewing the galaxy. Yellow notes the major political fictional forces in the Star Trek world. Creation of this image was aided by information from the The Canadian Galactic Plane Survey and StarTrek.com. Other spacetime theories included additional dimensions-normally spatial with theories including temporal dimensions, and even some including dimensions neither temporal nor spatial (e.g., superspace). By combining space and time into a single manifold called Minkowski space, physicists have significantly simplified a large number of physical theories. Spacetime, a coordinate grid spanning 3+1 dimensions locating events (rather than points in space), has time being just another dimension on the coordinate grid. Always believed to be independent of motion and progressing at a fixed rate, experiments showed time slowing at higher speeds of an object relative to another object (time dilation). Confirmed time dilation were the slowing of atomic clocks aboard a Space Shuttle, compared to synchronized earth-bound inertial clocks. But it’s possible the universe has more than 4 dimensions as string theory-compactified dimensions, which predict 10 or 26. It seems string theory has more than four dimensions and occurs at the subatomic level, at a scale no larger than the Planck length. While spacetime is viewed from Einstein’s 1905 theory of special relativity, it was first proposed by one of his teachers, Hermann Minkowski in a 1908 essay extending Einstein’s work. However, Minkowski’s “spacetime” turned out to be part of Einstein’s development of general relativity, when the correct description of the effect of gravitation on space and time was found as a “warp” or stretching in the fabric of space and time. Hence, the term “warp” is applied in most “Star Trek” episodes. The world line, is distinguished from the concept of “orbit” or “trajectory” by the time dimension. For a slower-than-light object it’s always a time-like curve. A massless particle-such as a photon-is a light-like curve, and a space-like curve could be the world line of a hypothetical tachyon-an entity that always moves faster than light-part of Star Trek lore. In relativistic contexts, time cannot be separated from the three dimensions of space, because the observed rate at which time passes for an object depends on the object’s velocity relative to the observer. When space and time are joined, Einstein realized an object in motion actually experiences time at a slower rate than one at rest. Existing technology has been proven this multiple times. According to the Star Trek writer’s guide for The Original Series, warp factors are converted to multiples of c with the cubic function v = [w3c], where w is the warp factor, v is velocity, and c is the speed of light. Therefore, “warp 1” is equivalent to the speed of light, “warp 2” is 8 times the speed of light, and “warp 3” is 27 times the speed of light. More advanced warp speeds can be found in Engineering Department- Warp Speed Defined – Star-Fleet. But Warp drive – Wikipedia, the free encyclopedia, shows Michael Okuda’s new warp scale. Roddenberry was precursor of future information just like Einstein. For Star Trek: The Next Generation, Star Trek artist Michael Okuda devised a formula based on the original one but with important differences. For warp factors 1 through 9: [v = w10/3c]. wf = cube-root of [velocity(v) / speed of light(c)]. wf = [10x] cube-root of velocity(v) / speed of light(c). A former Chemical Engineer, Kevin Roeten enjoys riding the third rail of journalism: politics and religion. He is a Guest Columnist for the Asheville Citizen-Times, and the Independent (Ohio), writes for numerous blogs, is an amateur astronomer, and delves into scientific topics. Can A Rogue Planet Really Exist In The Solar System?